You need to build an iOS app around your team’s API or integrate a third party API. You need a quick, clear guide to demystify Xcode and Swift. No esoteric details about Core Anything or mathematical analysis of flatMap. Only the nitty gritty that you need to get real work done now: pulling data from your web services into an iOS app, without tossing your MacBook or Mac Mini through a window. You just need the bare facts on how to get CRUD done on iOS. That’s what this book will do for you. Designers, managers, UX pros, ... It’s a programming book. All the monospace font inserts will probably drive you crazy. Work through the tutorials as written, creating an app for GitHub Gists. You’ll understand how that app works and later be able to apply it to your own apps. List the tasks or user stories for your app. 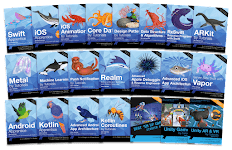 Compare them to the list for the gists app, focusing on the number of different objects (like stars, users, and gists) and the types of action taken (like viewing a list, viewing an object’s details, adding, deleting, etc.). We’ll start with that task in the next chapter. We’ll analyze our requirements and figure out just what we’re going to build. Then we’ll start building the gists app, right after an introduction to making network calls and parsing JSON in Swift. Like anything in tech there are plenty of buzzwords around web services. For a while it was really trendy to say your web services were RESTful. If you want to read the theory behind it, head over to Wikipedia1. 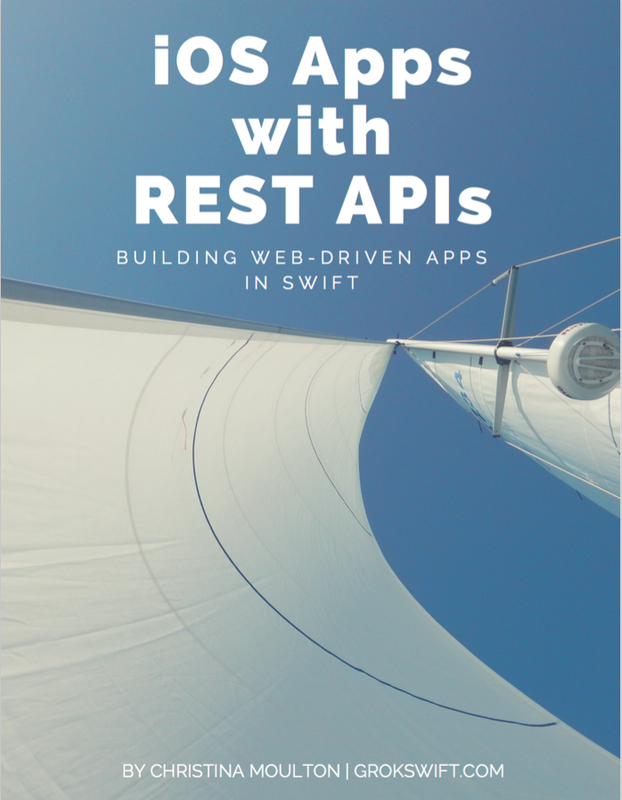 For our purposes in this book, all we mean by “REST web service” or even when we say “web service” or “API” is that we can send an HTTP request and we get back some data in a format that’s easy to use in our app. Usually the response will be in JSON. Web services are wonderful since they let you use existing systems in your own apps. There’s always a bit of a learning curve with any web service that you’re using for the first time since every one has its own quirks. Most of the integration is similar enough that we can generalize how to integrate them into our iOS apps. If you want an argument about whether or not a web service is really RESTful you’re not going to find it here. We’ve got work that just needs to get done. In this book we’re going to deal with web services that return JSON. JSON is hugely common these days so it’s probably what you’ll be dealing with. Of course, there are other return types out there, like XML. This book won’t cover responses in anything but JSON but it will encapsulate the JSON parsing so that you can replace it with whatever you need to without having to touch a ton of code. If you are dealing with XML response you should look at NSXMLParser2. This is version 1.1.1 of this book. It uses Swift 2.0, iOS 9, and Xcode 7.1. When we use libraries we’ll explicitly list the versions used. The most commonly used ones are Alamofire 3.1 and SwiftyJSON 2.3.
versions 1.0 and this version can be found on GitHub3. All sample code is available on GitHub4 under the MIT license5. Links are provided throughout the text. Each chapter has a tag allowing you to check out the code in progress up to the end of that chapter. Individuals are welcome to use code for commercial and open-source projects. As a courtesy, please provide attribution to “Teak Mobile Inc.” or “Christina Moulton”. For more information, review the complete license agreement in the GitHub repo6. The information provided within this eBook is for general informational purposes only. The author has made every effort to ensure the accuracy of the information within this book was correct at time of publication. Teak Mobile Inc. and/or Christina Moulton do not assume and hereby disclaims any liability to any party for any loss, damage, or disruption caused by errors or omissions, whether such errors or omissions result from accident, negligence, or any other cause. Teak Mobile Inc. and/or Christina Moulton shall in no event be liable for any loss of profit or any other commercial damage, including but not limited to special, incidental, consequential, or other damages. Any use of this information is at your own risk. This book identifies product names and services known to be trademarks, registered trademarks, or service marks of their respective holders. They are used throughout this book in an editorial fashion only. In addition, terms suspected of being trademarks, registered trademarks, or service marks have been appropriately capitalized, although Teak Mobile Inc. and Christina Moulton cannot attest to the accuracy of this information. Use of a term in this book should not be regarded as affecting the validity of any trademark, registered trademark, or service mark. Teak Mobile Inc. and/or Christina Moulton are not associated with any product or vendor mentioned in this book. Apple, Xcode, App Store, Cocoa, Cocoa Touch, Interface Builder, iOS, iPad, iPhone, Mac, OS X, Swift, and Xcode are trademarks of Apple, Inc., registered in the United States and other countries. GitHub is a trademark of GitHub, Inc. registered in the United States. Mashape is a trademark of Mashape, Inc. registered in the United States.